One of the main contributing factors to declining indoor air quality in our homes is that we are building our homes tighter than ever before. There is less outside air infiltration pushing stale polluted air out of the home. Air-borne contaminants and pollutants remain in the air we breathe, to be drawn into our lungs. Air flowing through our duct systems can be carrying viruses, mold, dust mites, and bacteria. Mold, especially can be growing on the indoor coil of your air conditioner or heat pump. This is especially prevalent in heat pumps, due to the lower heat produced when a heat pump is running. A furnace puts out higher temperature air, which tends to kill the microbes that thrive in condensate pans and on evaporator coils. If your heat pump system smells like "Dirty Socks", mold spores and toxins may be being distributed into the air by the blower. Today's tighter construction can also allow moisture to build up in unique and hard to get to places, such as inside walls, above ceilings, behind shower walls, and under floors. The best treatment here is prevention. Installation of an air circulation system and a dehumidifier should be considered in the modern home. For your heat pump or air conditioning system, cleaning the evaporator coil and condensate pan regularly can help the issue, but the best solution is installation of an Ultra-violet light (UV light). Place one directly over the AC coil, inside the ductwork. Place another one in the return ducting (or cold-air drop) just before the air handler. 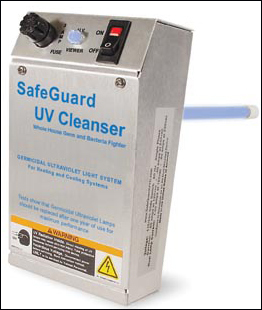 Uv lights will kill mold and bacteria that thrive in the forced air system. The most effective air purifier known to man is our Sun. Natural sunlight has been cleaning our outside air since before the dawn of man. Ultra-violet radiation (UV-C rays) inhibit the reproduction and growth of bacteria, fungi, viruses, molds, and other allergens and disease-causing microbes. This natural process does not occur inside our homes. Therefore, we must replicate the process with artificial Ultra-violet lights (UV-C). Combine an ultra-violet light with a good air filtration system and you have taken huge strides toward protecting your family's health and longevity. Most Hvac manufacturers produce their own version of the ultra-violet light. Many have air cleaners with an integral UV light built in. These units cover the return side of the forced air system, but do little to treat the issue that exists in the coil and pan area of the supply side of the system. Here a separate UV light can be cut in and inserted directly over the evaporator coil. 2) 120 volt operation, plugs into a standard electrical outlet. NOTE: Looking directly at the bulb when it is on can harm your eyes. Make sure the unit is unplugged or disabled before removal for servicing.